Vehicle Load Optimisation software complements and extends the in-built static and moving vehicle loading capabilities of LUSAS Bridge and helps to significantly simplify the evaluation of worst load position for various load configurations. Vehicle load optimisation is used to identify critical vehicle loading patterns on bridges and apply these loading patterns to LUSAS analysis models. 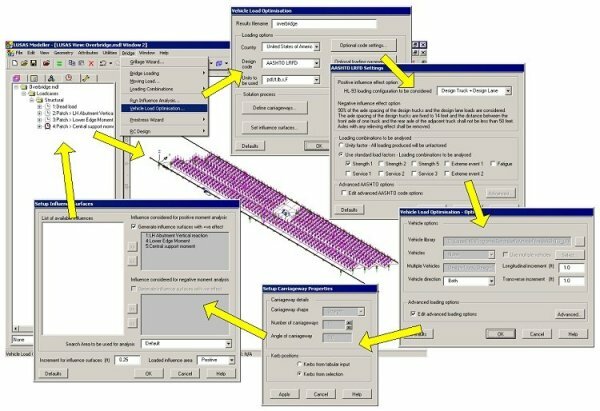 It reduces the amount of time spent generating models and leads to more efficient and economic design, assessment or load rating of bridge structures. One or more positions on the LUSAS model that are to be used for loading evaluation are selected and assigned influence attributes. Kerb lines representing the extent of the carriageway are defined. An influence surface for each position is automatically calculated and can be optionally displayed. The vehicle load optimisation facility interrogates each influence surface and calculates the critical loading pattern. The critical loading pattern can be optionally displayed prior to calculating loading effects. The critical loading patterns are then used to calculate the loading effects on the model. Critical loading patterns can be optionally superimposed on deformed or undeformed results plots. By using LUSAS Bridge with Vehicle Load Optimisation software the guesswork is taken out of bridge loading and a much faster evaluation of worst-case loading patterns is obtained. Onerous results table facility can optionally show sorted results for all chosen influences at nodes that are visible. "Using the LUSAS Vehicle Load Optimization facility expedited the live load analyses for a highly repetitive task that would have otherwise been extremely time consuming." Dr Ihab Darwish, Alfred Benesch and Company.